Terry Phillip, curator of reptiles at Reptile Gardens, left, places a hat back on top of a rattlesnake after the wind blew it off as John Brockelsby announces the release of the book “Rattlesnake Under His Hat: The life and times of Earl Brockelsby,” written by local author Sam Hurst. 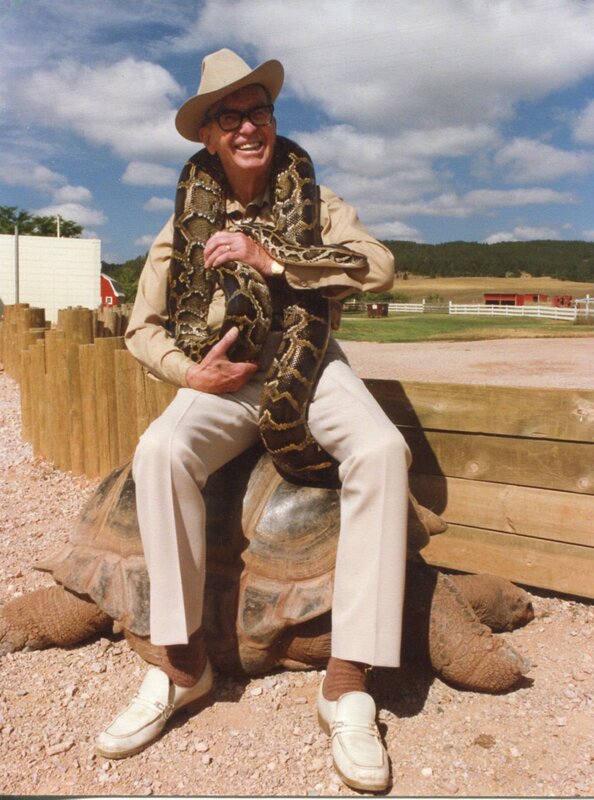 Earl Brockelsby is pictured here with a snake outside of Reptile Gardens in 1987. Sam Hurst, author of “Rattlesnake Under His Hat: The life and times of Earl Brockelsby,” talks with a reporter after the news conference announcing the release of the book Wednesday morning at Reptile Gardens. Reptile Gardens founder Earl Brockelsby worked at another attraction on Highway 16 just south of the present location. He enticed visitors to stop by standing on the side of the road with a rattlesnake, pretending to bite it. A rattlesnake sits coiled on the table after a cowboy hat was taken off of it during the news conference announcing the release of the biography “Rattlesnake Under His Hat: The life and times of Earl Brockelsby” Wednesday morning at Reptile Gardens. John Brockelsby announces the release of the book “Rattlesnake Under His Hat: The life and times of Earl Brockelsby” was written by local author Sam Hurst. How fitting that the show would be stolen on Wednesday by a buzzing prairie rattlesnake — the feared venomous pit viper upon which Earl Brockelsby built an iconic western South Dakota tourist attraction. On a cool blustery day, movers and shakers in Rapid City government and the local travel industry joined family members and employees of Reptile Gardens in a gathering to honor the official release of a biography titled “Rattlesnake Under His Hat: The Life and Times of Earl Brockelsby.” It was penned by Rapid City author and filmmaker Sam Hurst. As a prop to illustrate the book's title during Wednesday's news conference, a tan Stetson once worn by Earl Brockelsby had been placed on a table next to a podium where son John Brockelsby stood and began to speak of the book written about his father. “We consider this a very historic day…” Brockelsby began as a gust of wind collected the hat, which tumbled away and exposed a coiled rattler, tail extended and sounding its warning. Brockelsby continued, seemingly nonplussed by the poisonous threat to his well-being just a few feet away. He finally paused when reptile curator Terry Phillip retrieved the Stetson and deftly replaced it over the snake. “What? What happened, Terry?” Brockelsby asked. “Don’t worry about it, John,” Phillip replied, drawing laughter. As the driving force of a popular tourist stop which features alligator wrestling, giant tortoises and exotic tropical plants among its many attractions, Earl Brockelsby would likely have appreciated that bit of showmanship, however unintended. As a young man raised in Kadoka, Brockelsby had been fascinated by snakes and other reptiles on his days spent in the South Dakota Badlands. Moving to the Black Hills as a teenager during the Great Depression, Brockelsby found work as a tour guide at a long-gone attraction called Hidden City, not far from where Reptile Gardens sits today, south of Rapid City on U.S. 16. John Brockelsby recalled how his father often ended his tours by casually removing his cowboy hat to wipe his brow, startling tourists with the sight of a live rattlesnake coiled on top of his head. “You can imagine the people taking the tour at that time. They couldn’t care less about Hidden City. They either wanted to know about reptiles, rattlesnakes or the nut case that would have one on top of his head,” John Brockelsby said. “That’s what really gave Dad the seed for starting Reptile Gardens,” Brockelsby said. In the biography released Wednesday, on what would have been Earl Brockelsby’s 100th birthday, Hurst details how Brockelsby founded Reptile Gardens in 1937, four years before the carving of nearby Mount Rushmore National Memorial ended at the onset of World War II. The attraction, which earned less than $4 on its opening day, was then situated at the top of a long hill just outside of Rapid City to take advantage of motorists pulling off to cool their overheated radiators. Reptile Gardens moved to its present location in 1965, and was rebuilt after a devastating fire in 1976. As a foundation for the book, Hurst used nearly 400 pages of notes from a tape-recorded memoir Brockelsby had started, fleshed out by more information gleaned from nearly 4,000 letters and other personal correspondence found in Reptile Garden’s archives. “What really motivated me was how central Earl was to the economic development and the sense of community of western South Dakota,” Hurst said. “The story led into a whole examination on the development of automobile tourism, his attitudes on the American West and how people would relate to the American West. It just sort of unrolled from there,” he said. The book also devotes significant narrative space to Earl’s service in World War II and his later involvement in Rapid City government. A proclamation by Rapid City Mayor Steve Allender recognized Brockelsby’s service as a city commissioner and later mayor in the late 1940s and as a member of the Rapid City school board in the early 1960s. "Earl was always proud to call Rapid City his home," Allender wrote. Another proclamation, this one from Gov. Dennis Daugaard, recognized the contributions of Brockelsby, who died in 1993 at age 77 and was inducted into the South Dakota Hall of Fame in 2000. “Earl is considered one of the founding fathers of the South Dakota tourism industry, devoting time and effort into promoting the state,” Daugaard wrote. Hurst will autograph copies of the book on Saturday at 1 p.m. at Reptile Gardens. Books are available through earlbrockelsby.com or at amazon.com. “This is an extraordinary biography. Sam has done a superb job of capturing the life of my father,” John Brockelsby said.